Exactly three years ago I read the first in this series, Grave Mercy, and absolutely loved it. 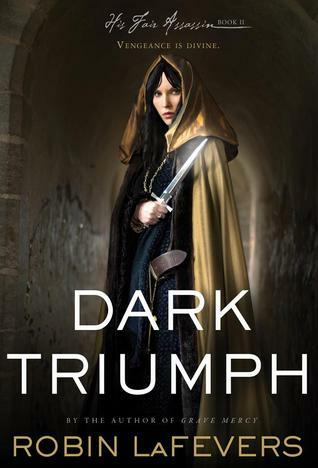 I don't know why it took me so long to read the sequel, Dark Triumph, but I do know that I will be starting the final book in the trilogy today. Robin LaFevers is an author who can hook and surprise me. Sybella is a handmaiden to Mortain and her skill is in death: spotting who is marked for death and carrying it out. It is this talent that leads to her placement in the castle of d'Albret, with the mission of killing him to protect the Duchess from his evil desires. As in the first book of the series, things don't go as planned and Sybella must learn who she can trust, before she is out of time. I found Sybella to be an even more fascinating character than Ismae from the first novel. Her complicated past affects all her actions, but she is still able to open herself up to love. And what a love! 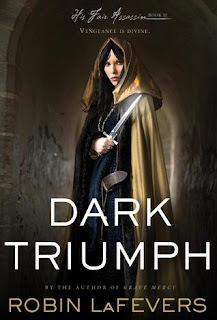 I don't want to spoil anything, but I will say that the love interest in Dark Triumph is the best I have read in a long time. Clearly, this is a book for an audience far older than my fifth graders. I greedily read it for my own pleasure as I will do with the next, right now.